The large sheet metal doors were open. I went in. Inside, someone animated by a fierce childish willfulness had used an enormous number of packing cases to build a series of awkward passages, with walls about nine feet high for a start, but dropping to just over a foot and a half as you went further in. The passages formed concentric circles around the skating rink. In the center of the rink was a dark huddled mass, black like some of the beams running clear across the ceiling. Blood, from various parts of the fallen body, had flowed in all directions, forming patterns and geometrical figures that I mistook at first for shadows. In some places it had almost reached the edge of the rink. Kneeling down, feeling dizzy and nauseated, I observed how the ice had begun to absorb and harden around all that butchery. In a corner of the rink I spotted the knife. 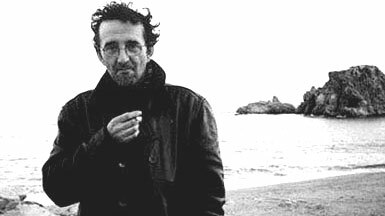 The three narrators are only tangentially related to one another and one of the elements of the book I most enjoyed was watching Bolaño assemble their disparate lives and slowly bring them into parallel. 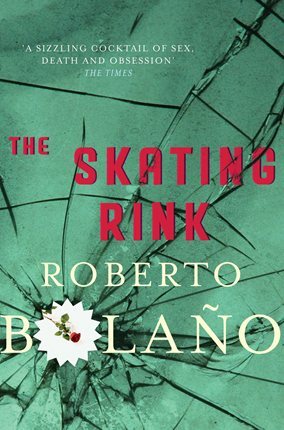 The murder does not occur until about the halfway point in this 182 page novel; every moment until then is spent getting the protagonists to the skating rink on time. Trust is required and seeing the connections finally click into place is one of those satisfying readerly moments in action. Telling the story in separate channels also heightens the mystery, leaving the reader uncertain just where it’s headed and what the varied cast has to do with any of it. To be sure, this isn’t a murder mystery per say, more of a variation on noir themes (and would make a fine film, by the way). All three men have a seedy or unsavoury element about them and there exists a delicate tension to their rare interactions – Morán and Heredia are old friends from Mexico City (back in the vague shifty territory of our adolescence) and Morán gets Heredia a job as night watchman at a campground he owns, yet they are uneasy and avoid each other afterward. Rosquelles meanwhile has no knowledge of Heredia but has long sought to put Morán out of business and their enmity only increases as they come into rivalry for the same woman. It could have been an amusing variation on the love triangle, if death hadn’t butted in. Caridad was behind me, holding a broad kitchen knife, whose blade seemed to be concentrating the sepia glow of the clouds, filtered through the branches above her. Luckily she gave me a wink; otherwise I would have thought she was intending to plant that knife in me. She looked for all the world like a ghost. With a chilling delicacy, she displayed the knife as if displaying one of her breasts. And the Germans must have seen, because now their gazes seemed to be saying, We don’t want to die, we don’t want to be wounded, we were joking, we don’t want anything to do with this. What Bolaño excels at in this novel is pure atmosphere. Z is a landscape just begging for crimes to be committed and its narrators seem equally drawn to that walk of life. Heredia obsessively pursues Caridad without any concern for the consequences while Rosquelles cannot disguise his pride in engineering his own ruin, in feeling for a moment as if he had no limits: How could they have swallowed everything I told them? It’s a testament to human gullibility… they were swayed by my confidence; my willpower was irresistible… I had never felt better in my life, that’s the truth. With its impeccable noir atmosphere, intriguing cast, exotic location and pageturning plot, is there anything to complain of? For me, there was only one slight drawback. The paragraph was invented for a reason. Perhaps discarding it is meant to “propel” the reader forward; if so, I disagree with its use here. If the narrators were recounting in a frenzied, feverish state, it would stylistically gel but only Rosquelles approaches such a mentality – both Morán and Heredia are careful, collected tellers. The chapters are quite short on average, so it wasn’t overwhelming but it did seem wholly unnecessary on Bolaño’s part. Looking back, I see that most of my chosen quotes are from the Remo Morán segments, a clear indication that I found him the most compelling character, or perhaps the hardest to figure out. The Skating Rink is a novel of ambiance. I am strongly reminded of the John Hawkes approach to crime fiction – the bigger picture is still there but the focus is so narrowed as to ignore explanation in favour of mood and imagery. There is no unveiling, no moment of truth, only intangible motivations, strange synchronicities and eventual disappearances. This is a book that deserves multiple readings.